Idaho Gold And Gem Outfitters – There's Gold In Them Hills! 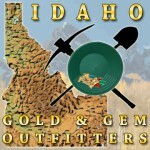 Idaho Gold and Gem Outfitters seek to help you get out and find more gold and gems in Idaho! We can help you get the equipment and learn the techniques to help you find more gold and gems and have a great time out there in the wilds of the great state of Idaho! More than equipment and guide services for gold and gems we seek to educate our customers in the rich history of mining in Idaho. It is part of our mission that through sharing the history of these places we can help preserve what is left of a quickly disappearing culture. Mining has received a bad reputation in recent years and we are working hard to change that perception. We love the wild, natural places in our country and believe passionately that they should be free for everyone to enjoy. Being outdoors is one of our greatest natural pleasures and it’s sad that it has been lost in this modern age. We are avid stewards of the land, because it is where we live the best part of our lives; we hope that with your help we will be able to make sure these beautiful places are around for years to come. Want to find more gold and gems in Idaho? Contact us! !